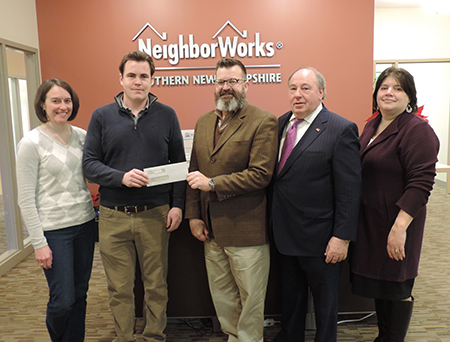 NHCIBOR Cares recently made two contributions totaling $2,000 to NeighborWorks Southern New Hampshire. One gift is for general support of the organization’s work to create affordable housing opportunities in New Hampshire and the second is a directed gift from the DeStefano-Barrett Legacy Fund in honor of Robert Cruess, a member of NHCIBOR. Shown at the presentation are, from left: Jennifer Vadney, NeighborWorks Southern NH; Gaelen Cruess, TFMoran; Robert Tourigny, NeighborWorks Southern New Hampshire; David Grappone, KW Commercial; and Laura Nesmith, Colliers International. DeStefano Architects of Portsmouth has won “Best of Customer Service” on Houzz, the online platform for home renovation and design. The honor is based on several factors, including D|A’s overall rating on Houzz.com and client reviews submitted in 2018. Ellen Mulligan is being honored as the top producer for the Center Harbor Coldwell Banker Residential Brokerage offices in Center Harbor and Wolfeboro with over $30 million in closed sales for 2018. Dana-Farber Cancer Institute has signed a long-term lease to occupy more than half of the 96,000-square-foot building at 5 Branch St. in Methuen, Mass. Renovation of the space is underway, and Dana-Farber expects to open in early 2020. Bob Richards of Cushman & Wakefield represented the tenant and Brooks Properties, owner of the property, was represented in-house. Salem, NH-based Brooks recently completed a new four-story medical office building in Salem, and has three-story medical office building under construction in Salem as well. Paty Ciotto has joined Peabody & Smith Realty’s Meredith office. Rick Schlager of Brentwood has rejoined Blue Water Mortgage Corp., an independent mortgage broker serving Massachusetts, New Hampshire, Maine, Connecticut and Florida, as area manager and senior loan officer based in Hampton, NH. In addition, Blue Water has hired Kerry Donovan of Merrimack and Stephen Buchan as loan officers.